The library provides book deposit drops for those who can not return library material during library hours. 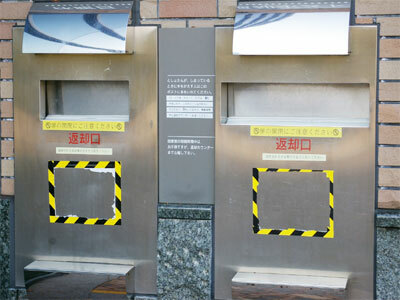 The book deposit drops are located right by the main library entrance and on the left side of the library right by the library's sub-entrance. Book deposit drops are closed during libraries hours and can only be used when the library is closed. Compact discs, audio cassettes and video tape can be damaged if they are returned using our book deposit drops. For this reason, please return all compact discs, audio cassettes and video tapes directly to our Video Library. Please do not return these library materials using our book deposit drops.